Micromobility is an industry focused on evolving transportation – Primarily the first and last mile between your origin or destination and the primary public transportation hub. Whether you are offering bikes or scooters, dockless or docked, the goal is to provide an accessible, on-demand transportation alternative. Micromobility has driven unprecedented investor interest in 2018, generating a number of market leaders. 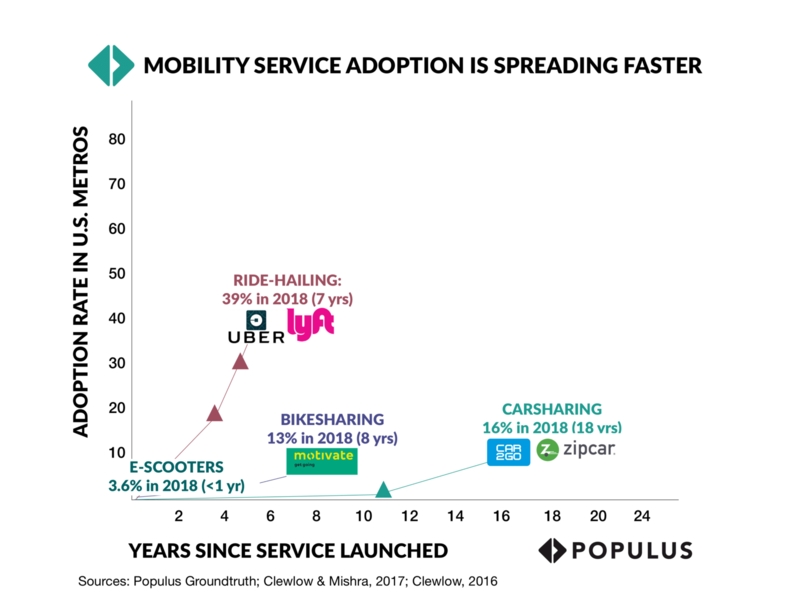 Automakers are also taking notice, with Ford acquiring scooter-sharing platform Spin in November (CB Insights). A fleet of scooters or bikes can be deployed in hours by a small crew, requiring minimal maintenance and no infrastructure changes. These vehicles are also GPS-enabled, meaning they can provide mobility data at scale in areas where it was previously unavailable (CB Insights). From the early days in Santa Monica, availability has expanded nationwide with many cities onboarding this mode of transportation. Companies like Bird and Lime have seen massive growth in the past 2 years, and many new entrant are launching in cities this year. Since the introduction of the first domestic dockless bikeshare system in Seattle in the summer of 2017, cities and universities have quickly adopted and introduced programs. Users left their bike locks at home as 2018 saw ~1.6K bikeshare systems worldwide. Mopeds, electric bikes, drones and motorcycles we’ve seen it all. Sharing platforms are sprouting up offering unique solutions to the same first/last mile problem. Launching a bike sharing or e-scooter fleet in a new city can be confusing, and having the right insurance can make or break your application with a city. We’ve mapped out the 3 key steps to ensure you’ve got the right coverage and are positioned for rapid growth. From San Francisco to Ft. Lauderdale, Chicago to Austin cities require differing levels of coverage in order to operate within city limits. Founder Shield has amassed knowledge of the insurance requirements of all major U.S. cities and will review your Permit Application to ensure all areas are met. Seeking to rapidly expand in the U.S., no problem! We know exactly what program structure is needed to effectively roll out operations in all key markets. Save the back and forth, countless email chains, we know exactly what information is required to secure effective coverage. Only a few insurance carriers will touch the micromobility and we work closely with all of them! Our partners have the capability to provide a true worldwide solution, important as you expand in the U.S. and abroad. Initial Call Screening where we introduce our process and set expectations. Next Steps provided outlining all required information, applications, and reasons for it. Access to an experienced broking team – Questions answered when you need them! Moving into a new market? Expanding globally? We assist in the reporting to ensure your program always reflects existing operations and offer true global capabilities. We partner with leading mobility and on-demand insurance carriers that craft custom policies that are designed to scale as you do. You focus on expansion, we’ll make sure insurance doesn’t become a barrier to growth. What are the minimum insurance requirements? It will depend on what city you plan to operate in but typically you will need to meet the below requirements (with the city being named as an additional insured). What Insurance do Micromobility companies need? General liability is intended to provide coverage for 3rd party bodily injury or property damage caused by your operations or at an insured location (your office space). The policy is intended to not only pay for restitution to the injury or property damage but also pay for the costs of litigation as well. Excess General liability is known as a following form policy and is an extension of your general liability policy’s limits. If a claims situation is to arise that exceeds the limits of your underlying GL policy, the excess will pick up first dollar above that amount! Again, the potential of a costumer being injured while operating a device is the largest exposure the micromobility space faces. Due to the potential catastrophic injuries that could be suffered, and the ensuing lawsuit, the standard $1M per occurrence and $2M in the aggregate, may not be enough to cover defense costs and damages. Additionally, most of the bigger markets you will look to move too will require anywhere from $3M to $10M in excess coverage. Property insurance is intended to provide coverage for damages to property owned by the company. While the general liability policy is intended to provide coverage for damage to a 3rd parties property through your operation, it would not provide any coverage for property owned by you, the named insured. That is where the property policy comes in. With the need for maintenance and rolling out more scooters/bikes at any given location, there will be a need to store additional units at a location in the cities you operate. The property policy will help you recoup the value of this inventory (as well as your office property) should a damaging event (i.e. a fire) occur at one of these locations. Auto liability insurance, both commercial and hired and non-owned, are intended to fill a gap in your general liability insurance. Like a GL policy, the auto liability policy is intended to provide coverage for 3rd party bodily injury or property damage as a result of your operations specifically tied to the use of automobiles. GL policies specifically exclude these sorts of claims, which create the need for this separate insurance product. Transporting scooters/bikes to and from the warehouse for deployment and maintenance typically requires the use of automobiles. This means that there is an exposure of drivers out on the road driving on your company’s behalf. Should there be an accident resulting in 3rd party bodily injury or property damage, you would need to rely on this type of coverage for the damages. As with the GL / Excess policy, a majority of the cities will not allow you to begin operations without one of these types of policies. Cyber insurance is designed to protect companies against lawsuits from third parties and fines and penalties from regulators. The goal of these policies is to address the risk exposure created by various electronic activities, the most common of which being the collecting or storing some kind of PII (personal identifiable information). If you rely on an app for customers to utilize your scooters/bikes, Cyber insurance is a must. Each individual who joins your app is considered one record of PII and if that information is to be compromised, you could be on the hook for large financial damages. PII ranges from name and address to the credit card they use to upload credit to the app, and even if this information is hosted by a third party cloud provider, should it be compromised you could be on the hook. Workers comp insurance is intended to provide coverage should one of your employees or contractors be injured while working on behalf of your company. Workers comp is a state requirement in a majority of states. Any individual, full or part-time, who works on behalf of your company is required to be covered under your policy unless you can provide proof they maintain coverage elsewhere. Electric scooters and dockless bikes are popping up everywhere. We dive into risk management and the future of the industry. What is Hired and Non Owned Auto (HNOA) Insurance? Does your business rent or hire vehicles? You should know about Hired and Non-Owned Auto Insurance. We break down who needs it and why.